- Remove backbone. This, in combination with moving the thigh/leg portion higher onto the breast, which serves to slightly insulate the breast from the heat, allows the turkey thigh and breast to finish at approximately the same time. - Brine for 24-hours, substitute buttermilk for half the water if you wish. - Place open cavity of turkey, where backbone was removed, on grate so bird is in the 'up' position. - Tuck leg/thigh over the breast. - Let rest 15 minutes before carving. - Note: Turkey backbone is completely removed and there is an open cavity underneath facing the cooking grate. 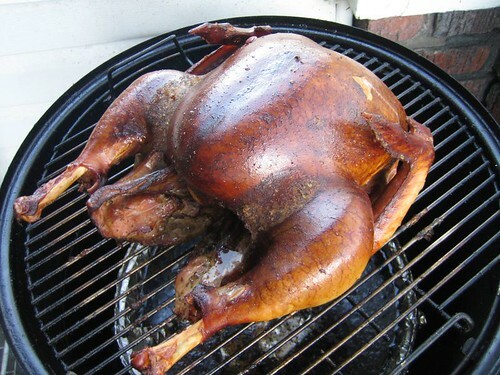 I have also smoked turkeys in my WSM many times (without the bone removal and manipulation) in a V-shaped rack. When I don't have time for a brine, sometimes I mix a compound butter with herbs, spices, pepper, and kosher salt, (whatever ones float your boat) and smear it under the loosed skin. The low, slow heat and smoky flavor just make them turn out so succelent. It my favorite way to do turkey. GWiv - I can attest to your fantastic Low and Slow lessons being easily adapted to turkey. Smoked turkey. Note the backbone is taken out and the thigh joint out of socket (maynot be easily evident; I think as it cooked it stiffened into shape). This was a small (fresh, farm) bird (don't recall size/weight) - more than plenty for two. My wife and I have been smoking turkeys for Thanksgiving for a few years and we always get rave reviews. The only thing I'll add to Gary's post is some additional thoughts on brining. If you have a medium to large turkey and can't fit the whole thing in the fridge to brine, cut the turkey into halves (removing the backbone) or quarters. 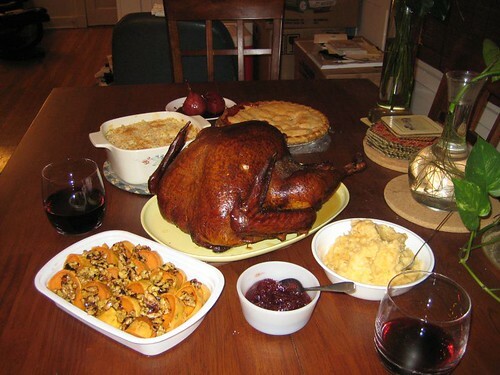 You won't be able to bring a whole, intact turkey to the table, but cooking quarters won't really affect the flavor. Quarters will also cook faster than a whole bird. The other thing you can do is put the whole turkey into a cooler, add the brine, and ice cubes, and leave outside (if it's cold outside). If you go this route, make your brine stronger (i.e. more salt per liquid) because as the ice melts, it will dilute the brine. Substitute roughly a half pound of ice for a cup of water. Edited to add: Gary notes to thoroughly dry the bird. This is important for getting crispy skin. My preferred method is to brine the day before I'm going to cook the turkey and then let the turkey sit uncovered (skin side up) in the fridge overnight. T-Day bird brine/backbone out method. 11-lb bird done in well under three hours with both breast and thigh arriving at delicious at the same time. Maybe a little eastern NC BBQ sauce on the side?